This latex neck support pillow is unique. The orthopedic latex neck support pillow has 5 different adjustable compartments and will adjust to your body. Each compartment of the neck support pillow can be adjusted individually and as well as the orthopedic form contributes to stability of the neck. With this unique orthopedic neck support pillow the muscle relaxation is substantially better comparing to other pillows. Firm: 14 cm, suitable for persons who would like a more firm pillow, which have a (x)firm mattress or who need more neck support due to their physique. (A) The latex neck support can easily be replaced due to the zipper. (B) The side compartments are made in a funnel shape. So the filling can not move to the back and will keep supporting not only the neck but also the head in the correct way. (C) The middle compartment is somewhat lower than the side compartments therefor the back sleeper will also sleep very comfortable. (D) Compartments C and E are divided by a septum and prevents the filling to shift. (E) When you would like or need a more soft neck support you can easily turn the pillow 180°. Material: cover with zippers: 100% cotton. Washable: Yes, the latex can be removed, than the pillow can be washed at max 60 degrees, though we advice 40 degrees. The Down Surround pillow has a soft feel under your head. For extra support, this clever 'down surround' pillow is for you. This european Down Surround pillow has three layers. The supportive core contains little goos feathers. The luxury comfy soft outer contains 90% goose down. Goose down has more filling power than duck down. With the goose Down Surround European pillow you will always lay down on lovely softness. Produced in a niche factory in The Netherlands, the pillow is encased in 100% pure cotton percale. This molded ergonomic cushion with a supporting core of latex allows a better support from the neck and head. 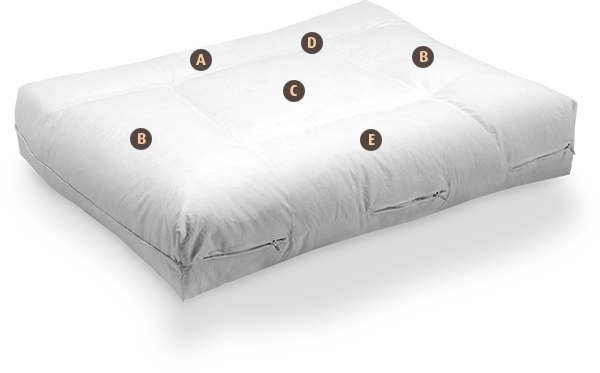 Covered by the down feather package the pillow provides a good ventilation and therefore a cooler feeling. This ergonomic pillow is available in 5 firmnesses, x-soft, soft, medium, firm, x-firm; the medium and firm is suitable for people who sleep on there side and (x-)soft for people who sleep on there back or stomach. For people with big shoulders or who sleep on a firm mattress, the x-firm pillow would be the best suitable. We are closed on both Christmas days (monday 25-12 and tuesday 26-12). For personal advice and/or visit outside above hours we will gladly make an appointment with you. Skoonbeds is part of Bedaffair.